Every guy lifting weights at the gym likes to have that ‘pumped’ look. When you’re pumped, your muscles look bigger and more vascular—they even feel tighter. The pump occurs during intense weight training sessions because lifting weights stimulates an increase in the amount of blood flowing into the muscles making them look bigger. Getting pumped also gives a huge boost in self-confidence too. And though it looks really good, the pump is really just for show, not substance. You can achieve the same pump whether you’re lifting very heavy weights for fewer reps or lighter weights for lots of reps. The pump is the result of excess blood flow into the muscle cells, so being pumped up doesn’t translate into stronger muscles because unfortunately, that pumped up appearance is only fleeting. A few hours after you step out of the gym, it’s gone. That’s not to say that the pump isn’t a good thing or that it’s not important. If nothing else, for the average weight lifter the pump is worthwhile just for the psychological boost that it provides. And if you are a competitive bodybuilder, then the pump is vital. In a competition, you need every visual edge you can get so it is essential that you get the best pump possible to really bring out the definition of your muscles and look your best. For most competitive bodybuilders, the process of getting pumped (The Great Pump) starts several weeks before the competition. But unlike the ordinary pump that is stimulated by lifting weights, achieving the Great Pump revolves chiefly around a specific nutritional approach that includes adherence to a demanding carbohydrate- and calorie-restricted diet. It is basically a very intense ‘cutting’ process that would normally follow a ‘bulking’ phase. The problem though is that the human body isn’t concerned about looking good for the competition. When you switch to an ordinary pre-contest cutting diet—a prolonged period of undereating—it causes the body to shift into survival mode. In this state, it doesn’t like to use stored fat for energy. Instead, it strives to preserve its energy stores (fat) for future needs and burns glycogen stores from the muscles and liver first, before moving on to the fat. As a result, though you do get leaner and more defined, there is a notable loss of muscle mass. There have even been scientific studies documenting this fact. For example, a study that appeared in the Journal of Sports Medicine and Physical Fitness showed that extended calorie- and carbohydrate-restricted diets negatively impact muscle mass. In this particular study one of the subjects—a male bodybuilder—consumed an average of 2,263 calories per day with 71% of those calories coming from protein and only 16% being derived from carbohydrates. 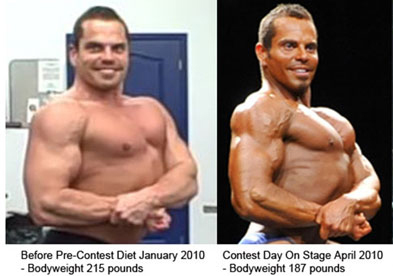 During his time on the diet, his percentage of body fat dropped from 16% to 4.4%. Interestingly, researchers concluded that about 25% of the pounds dropped were the result of the loss of lean muscle mass—that’s a lot of muscle mass to lose. Surprisingly, bodybuilders who follow this sort of strict regimen in an effort to achieve the Great Pump inevitably find that they actually look the most pumped up not the day of the competition but rather the day after the competition. This occurs because as I mentioned, a prolonged period of deprivation shifts the body into survival mode—aka a catabolic state—during which it limits the burning of fat for energy, preferring instead to pull energy in the form of glycogen from the muscle cells. The good part of this process is that it primes the body for jumping into a growth phase, which is activated post-competition when the bodybuilder allows himself the luxury of eating whatever he desires. 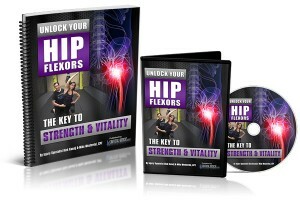 This knowledge of how the body functions can be used to your advantage to create the optimal state of the Great Pump. 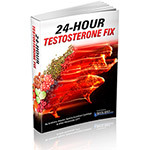 Essentially this approach focuses on combining a controlled period of undereating followed by a strategic period of overeating for the purpose of manipulating the body’s hormonal traffic cops to signal the body to shift into a rapid growth mode. When the hormones signal this shift, they are telling to the body to move into a maximum anabolic state. The most successful bodybuilders are aware of this hormone manipulation strategy and use it to their advantage to gain an edge in a competition. The primary principle here is to move into a controlled undereating phase and then prior to the competition, shift into a light carb-loading mode to shift the body towards its maximum anabolic state and achieve the Great Pump during the competition, not after it. If you want to experience the “Great Pump” I suggest you follow the outline that my bodybuilder friend Lee Hayward has put together that tells you exactly how to do it. A lot of people use this strategy even if they don’t compete and don’t have any intention of stepping on stage. Follow the guidelines from this article and you should be able to peak to look your best. If you’re going to follow Lee Hayward’s plan give yourself 21 days. 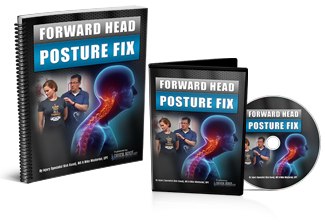 You can certainly give this a try on your own based on what you learned from this article. It’s not super difficult. 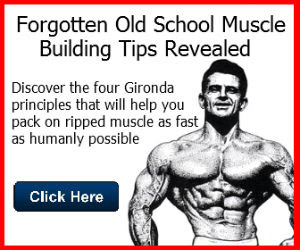 Keep in mind Lee has ironed out all the bugs so if you don’t have time to experiment head on over to 21 Day Fast Mass for some….well…”proven fast muscle”. Did You Know Many Locksmiths Are Fitness Fanatics? The more society becomes complex, the more it demands; whether physically, financially, or intellectually. With certain labor forces requiring physical endurance to complete a job, it's become almost impossible to ignore the need for health and fitness. 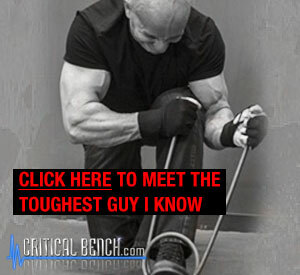 Critical Bench is a website of health culture information, latest health and fitness industry news, reviews, archives, and articles. The website also includes fitness products, excercises, proof, free items, interviews, trending, YouTube channel based on Mike Westerdal's fitness knowledge; all for the purpose of building muscle and strength. Not to mention, it offers a platform for goal-reaching based on the specific desire or need of the individual. 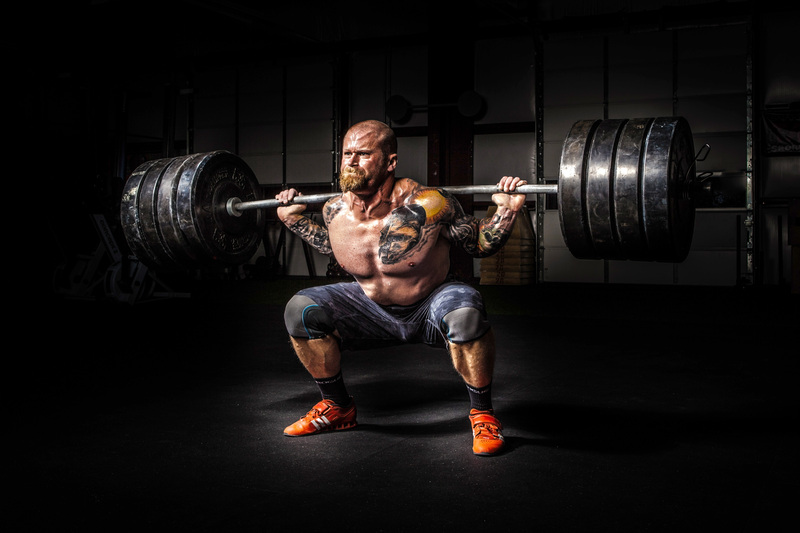 Health information sites such as Critical Bench play an important role in the lives of fitness enthusiasts, health freaks, and blue-collar working fields such as locksmithery. This is in part due to the fact that the field of locksmithing requires serious fitness, endurance, and strength: in order to arrive to locations on-call quickly, and to get the job done optimally. Some of the cheapest prices in the locksmith industry with mobile locksmiths are working round-the-clock at 247 Car Locksmiths, offering free quotes to clients. Their friendly dispatching system match each clients' needs and provide with the nearest available technician. High-quality, professional locksmiths are offered for all types of ignition switch services, car key service, transponder key service, and standard car lockout service. The service is performed on almost all car models including vans, motorcycles, RVs, and trucks: without any extra charges for nights or weekends. Using the latest and safest technologically-advanced tools as a consequence of in-depth research, each technician arrives on site with the tools and knowledge needed to take care of all lockout situations. There is almost no lockout issue in which the technicians haven't heard of or handled, as each one has been selected one by one to ensure credible experience and training within the field. Automobile services include car lockouts, ignition key extraction or replacement, car key replacement, key duplication, rekeying, car door unlocking, truck unlocking, jammed car key extraction, transponder key reprogramming, broken car key repairment, ignition switch replacement, and more; all with little to no damage. 247 Car Locksmiths is by far one of the top locksmith services to use when locked out of a vehicle; taking care of a myriad of car lockout issues; from a locked ignition switch, jammed or broken key inside the switch, to a dead engine upon driving. Providing reliable and professional service; staff and technicians are available twenty-four hours a day, three hundred and six days a year, to respond to clients' needs. The company specializes in car repairment for transportation vehicles and each locksmith is trained to get clients back on the road in no time, with little to no damage to the vehicle .The quick arrival of the technicians and speedy response time beats all locksmith companies in the industry, including a team of fully trained and experienced technician. Each locksmith is equipped with the necessary experiential background and tools needed to handle even the most difficult lockout conditions. The company promises a guaranteed fast response time on part of both customer representatives and technicians. From the east coast to the west, 247 Car Locksmiths gets you on the road in no time; taking care of almost all automobile types and manufacturers. To ensure the most optimal experience for clients with as little waiting time as possible, there exists approximately a twenty to thirty-minute estimated time arrival to the site location. To contact a local auto locksmith company, one may do so at (888) 254-1615 at any time of the day or night. Help yourself to this free PDF report from bodybuilder Lee Hayward. 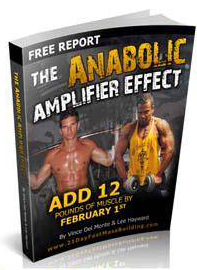 Its’ called the Anabolic Amplifier Effect. 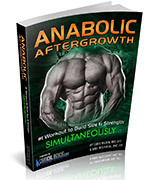 It’s about skyrocketing your muscle growth by triggering a natural release of your body’s 3 most powerful anabolic hormones – IGF-1, Testosterone, and Insulin! 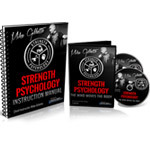 If you like this free report you’ll probably like Lee’s 21-Day Fast Mass Building Program which is set to be released on January 11th, 2011. 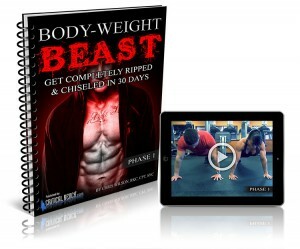 It’s a cool 21 day program that will show you how to gain 12 pounds of muscle in that time. Please read it over and share your thoughts below so we can discuss the pros and cons of this approach.